Since the withdrawal of US occupying forces, international attention has shifted away from Iraq – but life for Iraqis has become no easier. Deadly bombings are still all too common, sectarian violence has soared and all-pervading corruption means that massive inflows of aid and oil income have made very little difference to crucial issues like security, healthcare and power availability. Now, Iraqi lawyer Zaid Al-Ali sets out why and how the post-occupation Iraqi government has failed to achieve legitimacy or improve its citizens’ lives. He argues that the ill-planned US intervention destroyed the Iraqi state, creating a black hole which corrupt and incompetent members of the elite have now made their own. In particular, Al-Ali argues that the manner in which the constitution was drafted deliberately created a cleavage between large segments of the population, rather than bring people together. He also demonstrates that the system of government that the constitution establishes is so dysfunctional that the political class has refused to apply it. All constitutional frameworks depend on the capacity, professionalism and good faith of political elites to be successfully implemented, but in Iraq’s case, given that the politicians refused to apply the rules that were provided for in the constitution, state and society were left completely at their mercy. From 2006 onwards, the prime minister, the government and the parliament improvised the rules as they went along, deliberately and explicitly violating the constitution. In that context, Al-Ali argues that Iraq’s most senior politicians (most of whom spent decades in an unproductive exile) have no professional skills that are of any use to the state, are lazy, corrupt, very willing to engage in moral compromise, and conspiratorial in their thinking. Finally, rather than engage with the public and try to address its failures, the government has instead resorted to sectarianism to defend itself and stave off any criticism. The result is that Sunni/Shia/Kurd divisions have worsened since 2003. Al-Ali describes in detail how the absence of any constitutional rules to govern the state’s behavior, and the politicians’ incompetence and lack of compassion have degraded the state from within. The legal system is in crisis, human-rights abuses are commonplace and the natural environment, already degraded by Saddam Hussein’s destructive projects, is worsening every day. The book nevertheless ends on an optimistic note, arguing that the basis for a democratic culture already exists within Iraq. Al-Ali states sets out the fundamental components of any comprehensive programme for Iraq, and also sets out the beginnings of a strategy for how such a programme could be implemented in the country, despite the political class’ failings. Such an effort would take years to get off even partially off the ground, but efforts are already underway. “Zaid al-Ali’s [book is a] well-researched study of how Iraq has gotten into its current, worsening, and possibly terminal mess. The Struggle for Iraq’s Future is not a pretty story. Indeed it seems to be populated entirely by villains, from Saddam Hussein to criminally stupid or negligent American occupiers to the rapacious, self-serving, bloody-minded, and frequently murderous group of Iraqi politicians who have insinuated themselves into power in the Americans’ wake. […] Ali’s analytical clarity and his inside knowledge fill the gap in understanding Iraq that, for non-Iraqis at least, has widened markedly since America pulled out of its misadventure, abruptly withdrawing its last occupation troops in December 2011. Ali proves his case with lawyerly aplomb. What he shows is that while history may have dealt Iraq a hard hand, and perhaps also subtly inculcated destructive pathologies of power and violence, the terrible failure of post-invasion Iraq is mostly a product of specific policy choices made by particular individuals”. Read the full review. Max Rodenbeck is an American journalist and author. He writes for the Economist magazine, the New York Times and the New York Review of Books. Marc Lynch, Professor of Political Science and International Affairs at George Washington University, and Director of both the Institute for Middle East Studies and the Middle East Studies Program. “In this devastating book on Iraq and, by implication, much of the Arab world, Zaid Al-Ali brings together the best practices of a lawyer, constitutional practitioner and independent analyst. He identifies the terrible combination of problems in recent Arab state-building due to both indigenous miscreants and foreign arrogance and militarism. The book is painful reading sometimes, but is absolutely essential reading for a clear understanding of why the Arab world is in the throes of so many citizen revolts against domestic and foreign tyranny”. “In this fascinating story of Iraq’s first decade following the fall of Saddam Hussein’s regime, Zaid al-Ali merges a technocrat’s expert knowledge with a patriot’s zeal to expose the corruption, incompetence and malfeasance that have brought reconstruction to a virtual standstill and governance to the breaking point. He infuses his distressing analysis with insightful anecdotes based on his own experience as part of the rebuilding effort, in which he played a somewhat invisible yet important part, and contends that when the foundations – notably the 2005 constitution – are flawed, the structure erected on top of them is no less so, to deleterious effect. The way forward, he suggests, is to pursue a reset – a fundamental overhaul that Iraq’s current rulers are certain to reject and resist, and to therefore ground this effort in the stratum of mid- to senior-level state officials who are highly skilled, tireless, and imbued with a strong sense of duty to their country, and who have kept things going, incredibly, as the politicians have made an utter mess of things. This book is one of the very few in-depth studies to emerge from inside Iraq’s system so far this past decade, and hands-down the best”. “Zaid Al-Ali tells a story of almost continuous political crisis, caused not only by ‘corruption, incompetence and sectarianism’ but also by the failure of the constitution making effort as well as of the resulting constitution. For Al-Ali the American war and occupation, and especially the disastrous conduct of the latter are at the root of political and constitutional failure, that the externally imposed Iraqi elites in charge did very little to rectify. In his presentation, the ethnic and sectarian divisions of Iraq were at best intermediary causes, not historically deep-seated, and they were greatly exacerbated by the occupation’s policies. Al-Ali’s narrative is well written, argued and documented, paying equal attention to constitutional process, administrative decisions, party politics, economic policy and local struggles, both during and after the formal American occupation. It will be invaluable for all those seriously concerned with Iraq and its region”. “In April, Iraqi lawyer Zaid Al-Ali wrote a remarkably prophetic article arguing that Nouri al-Maliki, who had convinced many Iraqi voters in the just-concluded elections that he was a strong man, was actually presiding over a rapidly weakening state. The armed forces were a “paper tiger,” he argued, sapped by corruption and politicization and unwilling to fight. Six weeks later the Islamic State struck and proved Al-Ali right, as Maliki’s forces in the north melted away. “Very few general historical overviews have been written on the Iraq war, and particularly not from an Iraqi perspective. Al-Ali was involved in the transition, and it’s extremely valuable to have his insider view of what went wrong. Most of Al-Ali’s observations ring true, and all of the reforms he recommends would probably be a step forward”. Read the full review. 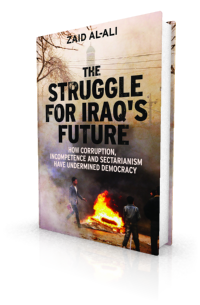 “In this book Zaid al-Ali sets out why and how the post-occupation Iraqi government has failed to achieve legitimacy or improve its citizens’ lives, covering how corruption has prevented aid and oil income making a difference to security, healthcare and power. Vivid descriptions of the extent of violence and low quality of life that became part of everyday life in Iraq are remarkable and give the reader a much closer understanding of what Iraqis, especially in Baghdad, have been going through”. Dr Zeynep Kaya is a Fellow at the London School of Economics. She completed her PhD in International Relations at LSE on the interaction between international norms and ethnicist conceptions of territorial identity with a focus on the Kurdish case. “The walled-off ‘Green Zone’ in Baghdad which houses Iraq’s political elites remains ubiquitous and symbolises the disconnect between politicians and the citizenry they purport to represent. Al-Ali’s The Struggle for Iraq’s Future shows the repercussions of this divide. His rewarding approach—telling the stories of ordinary Iraqis living outside the emerald city, while in the process describing the constitutional and political debacle that the country has become—brings human meaning to constitution making in Iraq with devastating effect”. Read the full review.